After four years of field trials in Bangladesh, Oxfam has adopted the ingenious BioFil Toilet for the Rohingya refugee response. These innovative toilets use a particular species of earthworm to compost waste. Around one million Rohingya people have sought safety in Bangladesh refugee camps in the last year. Bangladesh is one of the world’s most densely populated places, marked by extreme poverty, so the arrival of this new population places immense pressure on the country’s already fragile water and sanitation infrastructure. Management of waste, water and sanitation is therefore critical in these sprawling refugee camps, where the risk of cholera and other waterborne disease is ever-present. 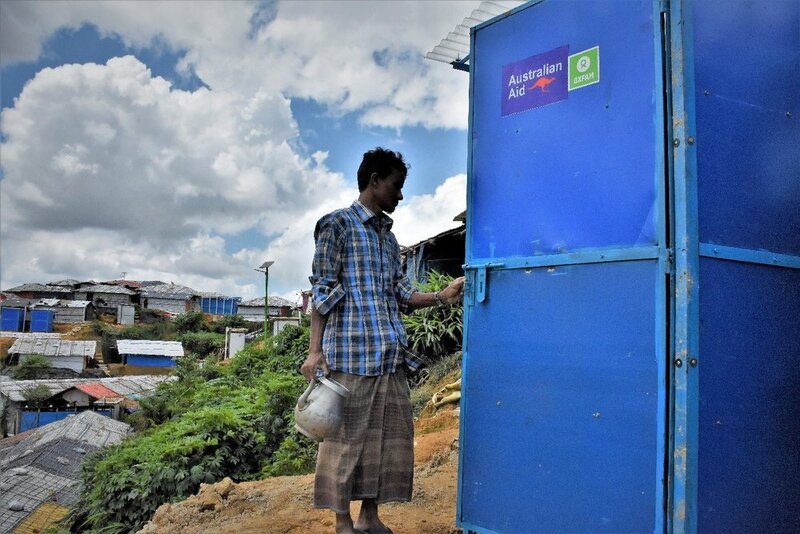 Supported by the Australian government through the Australian Humanitarian Partnership, Oxfam put in place more than 1,000 new BioFil toilets in Cox’s Bazar, dramatically reducing the volume of sewerage requiring treatment in the camps. The new toilets offer a range of benefits – they make use of local construction materials, generate compost and reduce odour.